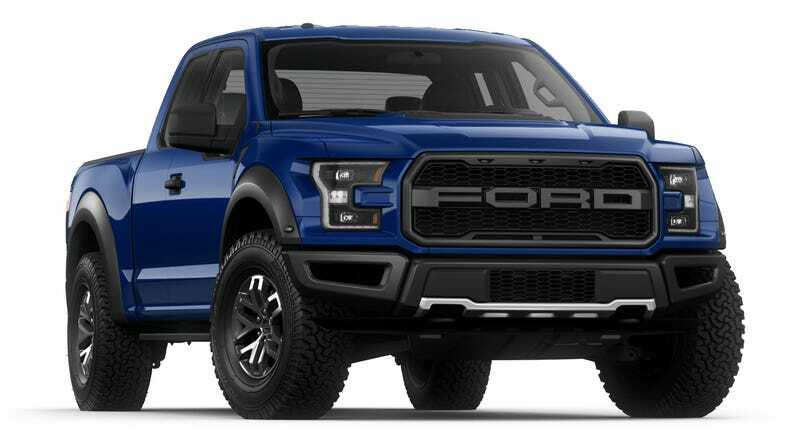 How Would You Spec Your 2017 Ford Raptor? The online configurator for the 2017 Ford F-150, including the long-awaited Raptor off-road variant, is finally online. And weren’t you just looking for some place to procrastinate? Hit up the the 2017 Ford F-150 build-and-price page and show us how you’d set up your turbocharged Bajamobile. After being a surprise-success at its introduction almost a decade ago, Ford saw fit to revise the recreational F-150 variant with a bigger engine a few years into its life. When the company completely redesigned the F-150 for 2015, there were a lot of questions about the Raptor’s future. Wonder no more– the new truck is supposed to be lighter, faster, and I think it’s a whole lot prettier. The V8 may be gone, but the 450 horsepower 3.5 EcoBoost just might be good enough to make up for its lack of rumble. The 2015 bodystyle really wears that Raptorfication well. And no, you don’t have to order the enormous “FORD” badge on the tailgate if you don’t want. You’ve probably already read about most of the listed options at this point, but somehow it’s still more fun to put your dream truck together yourself. Even if you’re not really in the market. Looks like cloth seats are actually the default, which is great. I hate how hot and sticky leather gets in the desert. But that two-tone kit is just so sweet I might have to suffer through the discomfort for the sake of swagger. I ended up going with a Supercab in Lighting Blue with about $10,000 worth of luxury items, a $750 black-and-orange interior decoration package and $1,100 beadlock wheels to end up with an MSRP a little over $60,000. But of course if you’re willing to slum it without any of the extra toys, you could come in under $50,000. Put every single option and accessory on the full four-door SuperCrew and you can crest $70,000. So what does your Raptor look like?